Rural business and government leaders gathered at the Utah State Capitol on Feb. 22 for Rural Day on the Hill. They shared success stories and discussed the challenges of doing business in rural Utah. “Once again, Rural Day on the Hill was a terrific event full of success stories and discussions of rural opportunities. Utah’s rural communities make up the majority of the landmass in the state; their contribution to the economic livelihood of the state can sometimes be overlooked. However, the work that our rural communities do for economic development is full of passion and enthusiasm for the future,” said Ginger Chinn, managing director for Urban and Rural Business Services at the Governor’s Office of Economic Development. Joan Hammer, Box Elder County Tourism, discussed the upcoming sesquicentennial of the completion of the transcontinental railroad. Festivities will be held May 10-12, 2019, at the Golden Spike National Historic Site. Rep. Robert Spendlove, chief economist with Zions Bank, gave an overview of Utah’s rural economy. Friends of Rural Utah awards were presented to Sen. Ralph Okerlund and Wes Curtis for their unwavering commitment to the people and issues affecting rural residents. Jill Flygare, Governor’s Office of Economic Development managing director of internal operations, discussed legislation impacting rural Utah. Lt. Gov. Spencer Cox concluded the morning with remarks about the benefits of doing business in rural Utah. Mark your calendar for next year’s Rural Day on the Hill scheduled for Wednesday, Feb. 19, 2020. 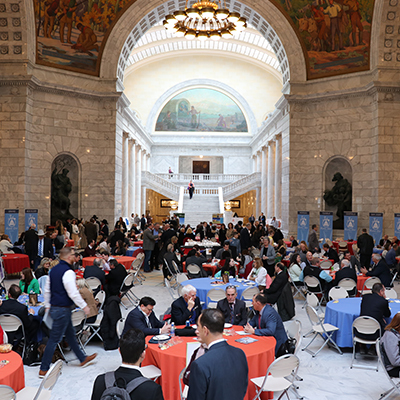 Rural business and government leaders gathered at the Utah State Capitol on Feb. 22 for Rural Day on the Hill.